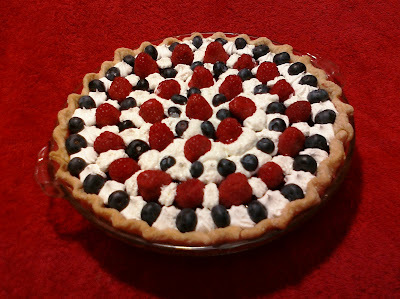 Every year, at the beginning of summer, I try to come up with a yummy red, white, and blue dessert for the Fourth of July. I decided that this year's recipe should be a pie since, A) I love pie, and B) it's been a while since my last pie recipe. At first, I had thought of making just a straight up blueberry pie, but then I kept adding things and before I knew it, I had come up with this recipe. Obviously, it's all about the presentation! And you KNOW it's also all about the taste! A cheese pie, with a layer of raspberry jam, fresh berries and whipped cream? HEAVEN! Seriously, what's not to love? It's really simple to make too. Make it for your July 4th BBQ! I'm sure everyone will love it!! Unroll pie crust. Dust lightly with flour. Place crust, floured side down, in a pie plate. Tuck edges under, then flute to make a decorative edge. Set aside. In a small bowl, beat the cream cheese, sugar, and vanilla until smooth. Add eggs. Beat on low speed until well combined. Using a rubber spatula, fold in blueberries by hand. Bake for 35-40 minutes or until center is set. Cool on a wire rack for 1 hour. Refrigerate until chilled. In a small bowl, using a wire whisk, stir jam until smooth. Spread jam over cheese filling. Decorate with whipped topping and fresh berries. I purposely didn't put the amounts of whipped cream or blueberries or raspberries. Basically, if you like a lot, add a lot. You don't have to follow my design, although, I must admit, it's pretty gorgeous. Do any design you like! Maybe whipped cream stars and berry stripes? I'm often asked how I come up with different recipes. Well, basically, I'll have an idea of what I want to do, then I'll look around online to see if there is anything close to what I want. I usually look for a recipe that has simple ingredients, is easy to prepare, and doesn't take forever to cook. Once I find that, then I'll try it exactly as it's written. Then I'll make changes to it to suit my own taste. For instance, this recipe was quite different the first time I made it. Yes, it was delicious, but it wasn't exactly what I had in mind. The first thing I changed was the chicken. I wanted to toss the chicken with pasta, instead of leaving the breasts whole, as with the original. So I decided to cut up the chicken into small pieces which works better with the pasta. Next, I changed the heavy cream. It was way too thick and FAR too rich, so I changed it to half and half. MUCH better. So far so good, but still not what I had in mind. Next.... The original recipe called for dried tarragon. I decided I didn't want the anise flavor of the tarragon, but still wanted the freshness of chopped herbs, so I opted for flat leaf parsley. Fresh, green, perfect. Done. The next thing I wanted to change was the amount of liquid. I needed the recipe to make more sauce. Like I said, I wanted to add pasta to the dish, and pasta always absorbs so much. I didn't want to just add more wine because I figured all the other flavors would be dominated by it. The solution? I slightly reduced the amount of wine, and then added chicken broth. This gave me the right amount of sauce for the pasta, it gave me greater depth of flavor, and the wine didn't overpower the dish. Perfect! NOW it's what I had in mind! It has a wonderful flavor, it's rich without being too heavy and it's still simple yet impressive to make. True, it's not something you'd have every night, but it's definitely something to serve for your next special occasion! Now that you know how much thought went into it, I hope you'll give it a try! Now if only I could come up with a name for it........hmm......any suggestions? Place 5 quarts of generously salted water in a large pot and set over high heat. While you're waiting for it to come to a rapid boil, make the sauce. In a large bowl, mix together 1/2 cup flour, salt and pepper. Set aside. Cut chicken into small bite sized pieces. Place all of the chicken into the bowl with the seasoned flour. Toss all together until the chicken is coated. Add butter and oil to a large skillet over medium high heat. Lightly brown, but don't cook the chicken all the way through. Do this in two batches, removing chicken to a bowl after each batch. Add the mushrooms and onions to the skillet, plus another tbs of butter, if desired. When the mushrooms and onions have softened and cooked down, add the parsley. Simmer a few minutes, then add the wine. Give it a good stir, scraping up any bits from the bottom of the pan. Add the chicken broth. Shake or whisk 2 tablespoons flour into the half and half. Stir into the wine/broth mixture. Add chicken back into the pan and let it simmer until the sauce has thickened and chicken is cooked through. Adjust the seasoning if needed, adding more salt and pepper to taste. Add pasta to boiling water. Let it cook for about 3 minutes. Drain well. Pour chicken and sauce over pasta and serve. I used Cremini mushrooms, which are baby Portobello mushrooms, but go ahead and use any kind that you like. Even better, why not use a combination of several different kinds of mushrooms? It'll only add to the flavor of the dish! Be sure to use a wine that you would drink and never use anything labeled "cooking wine". Also, be sure to generously salt the water before you boil the pasta. It should be as salty as a broth. I think the next time I make this, I might add a little fresh or dried thyme. I think that sounds kinda yummy, don't you? That's the beauty of cooking, you can tweak the recipe as much as you like!